For the fortunate millions who did not watch ABC News’s Being Melania: The First Lady last night, congratulations! I want that hour of my life back. Last week, Melania Trump packed her trunks with offensive outfits to traverse the 11 million square miles of soil where her husband absolutely may not step foot, declaring to a contingent press corps that she is her own woman. She went to rural Africa to fight cyberbullying. She tossed soccer balls to children and bottle-fed elephants. She performed empathy which will never manifest into meaningful legislation. She looked very happy to be out of the house. Maybe it was another act of silent defiance; maybe it’s an East Wing propaganda team aiming a hose against the violent river of diarrhea which courses from her husband’s mouth; maybe it was, just, coincidence, by someone who doesn’t understand the political and cultural implications of her appearances. On Friday night, ABC News correspondent and interviewer Tom Llamas promised viewers a “no preconditions,” nothing-off-the-table conversation, aimed to once and for all to answer that question: why does Melania Trump do anything? The result, shot in a paradisiacal Kenya wildlife preserve, was a predictably evasive non-conversation with someone who seems to care mainly about projecting a First Ladylike image, making visits to foreign poor people and kids and arranging White House decorations in really nice clothes. But Llamas did finally get her to explain one “message,” which is a first for Melania. 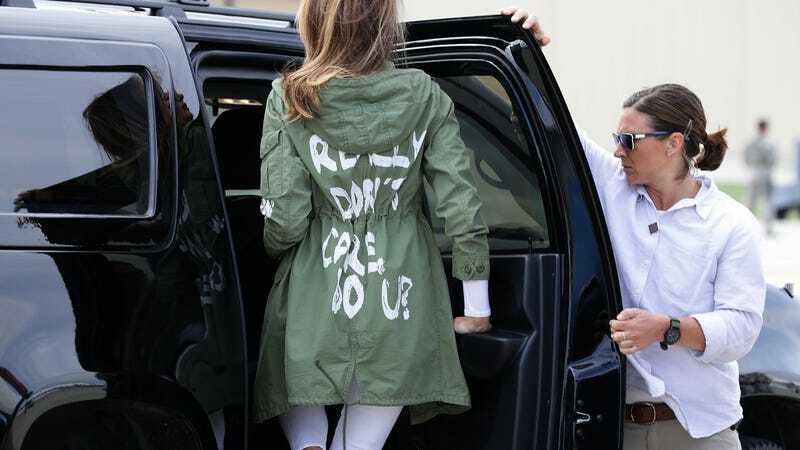 We finally learned that the infamous jacket which she wore to the border during the family separation crisis, reading “I REALLY DON’T CARE, DO U?” was, simply, about herself. ABC News noted that she’s crossed the line occasionally to indicate support for people her husband has bullied or threatened; she visited USAID, an organization which her husband has proposed defunding. She had voiced disapproval with the family separation policy. She makes judgement calls as to who’s trustworthy on the White House staff, according to Llamas, who claimed that White House sources called her “the gatekeeper.” She said that she’s been disappointed that certain “organizations and foundations” refuse to work with her because of her husband. Her message is Melania really does care. And so Melania marches on through softball interviews, working for her husband, whether she likes it or not, traveling the world and scooping up his shits.